Initial coin offerings (ICOs) this week shot past USD 7 billion in total funds raised over all time, but the ICO market crossed that threshold with a cold rush of air. Just nine ICOs closed in the past week, according to data from Token Report. Nothing to gnash teeth over, but consider this: Last week’s activity is about a third of the average number of ICOs transacted weekly in the past month. ICO data show January is heading toward about half the number of monthly closed ICOs seen in Q4. And the pipeline for new ICOs opened in Q1 looks thin and hungry. This is what the ICO winter looks like. 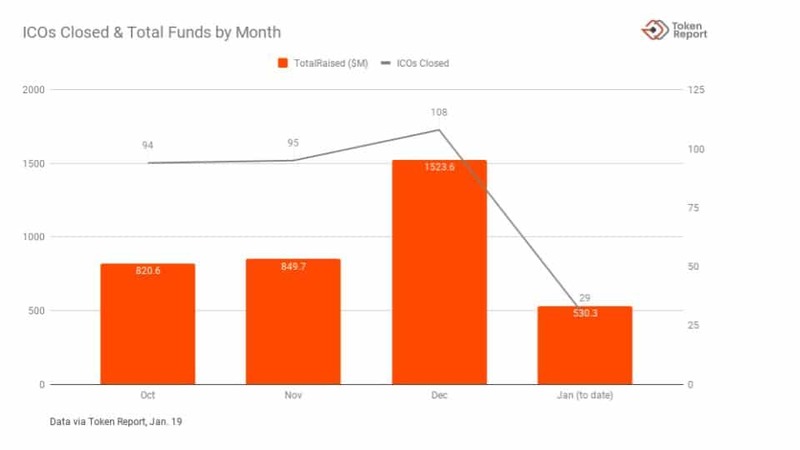 ICOs in January are on pace for a down month in terms of funds raised, too. Without Ethereum’s 33 percent month-over-month rise against the dollar (Dec. 19 to Jan. 19, per Coinbase), it might be much worse. Our ICO analysis at Token Report shows deal sizes changing, too. The pattern in January so far is fewer blockbuster fundraises among the top ICOs, and far fewer tiny deals eking out a million or two (barely enough to cover attorneys’ fees). As a result, the median ICO raise has grown larger, according to Token Report’s analysis of ICO data so far in the first quarter. The change began in December, when ICOs raised a whopping 1.52 billion USD, with a median fundraise of USD 11 million, nearly twice what ICOs at the median had been raising in November and October. In January, the median fundraise to date is at USD 15.5 million. Winter isn’t that bad, if you know how to ski. Here are the top ICOs of the month so far, including the past week. An earlier version of this story left off an ICO that occurred last week and should have been included in the deal and dollar counts chart for the month, as well as in the weekly top 10 table: Trinity State Channel (/TNC) raised USD 20 million in an ICO that closed Jan. 14. It’s been added to the top 10 list at the bottom, replacing Car Vertical (/CV), a car registry database, which raised USD 18.4 million in an ICO that closed Jan. 15. The inclusion of /TNC also increased the median fundraise for January to date up to USD 15.5 million. The chart, the copy and the table have both been updated with this data, which did not change the analysis of the ICO market presented in this article.